Part of Salt + Light's first upcoming Blessed Journeys Series is the famous Passion Play in the German village of Oberammergau. Ever had trouble sticking to a routine? Tried to do a daily exercise routine only to discover after a week that somehow it hasn't gone too well? Or committed your self to a new routine of daily prayer and after a couple weeks realize although you've been praying it hasn't been daily, exactly. The people of Oberammergau, Germany could put all of us to shame. In 1633 the town was caught in the crossfire of the Thirty Years War. Food was scarce and the undernourished citizens were succumbing to the bubonic plague. The town of Oberammergau decided to isolate itself from the outside world to prevent the plague from taking hold in their town. The plan worked well until October of 1633. The town decided to ago ahead with their annual festival celebrating the anniversary of the consecration of their church. One Oberammergauer was working as a farmhand in a nearby village and sneaked home for the festival. He had no way of knowing it, but he was carrying the plague. Within days both he and his family in Oberammergau were dead. By the end of that October 84 people had died in Oberammergau because of the plague. The tiny town was losing citizens fast. To stop the spread of the disease and famine, the town did the one thing within their power: they prayed. The town council and the citizens (those who were well enough) walked to the main church and prayed to be spared from the plague and famine. They vowed to God that if they were spared, every ten years they would put on a Passion Play – something common at the time – as an act of penitence, worship and thanksgiving. From that moment there were no more plague deaths in Oberammergau. 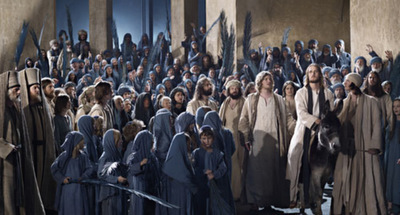 The next year, the residents of Oberammergau put on their first Passion Play. The entire cast and crew were the villagers of Oberammergau. Now 375 years later, the townspeople of Oberammergau are still putting on a Passion Play every ten years. The cast and crew are all from Oberammergau or have lived in Oberammergau for at least 20 years. Out of a population of 5200, about 2500 participate in the play in some way, either as cast, crew or front-of-house staff. The director, Christian Stuckle is a former wood carver. His theatre career began during his woodcarving apprenticeship when he put together an informal theatre group. He eventually left behind woodcarving in favour of theatre. Today he is the director of the Munich Volkstheatre or Folk Theatre and since 1992 has been the official director of the Oberammergau Passion Play. The music score being used was composed by Oberammergauer Rochus Dedler in 1820. The cast and crew are all Oberammergauers. Jesus is a psychologist, Mary Magdalene is a flight attendant, several of the high priests are wood carvers, Pontius Pilate is an innkeeper and Herod is a dentist. All decisions about the play are made by the town council, including casting, revisions to the script, and performance times. Casting is done one year before the opening day, and since no wigs or other artifical stage makeup is used, the male characters start growing their hair and beards at that time. The end result is a stunningly staged performance thought out to the last details including blankets on every seat to help keep guests comfortable as the theatre is partially open to the elements. The textbook means you can absorb the sounds and visuals, then go back and meditate on the text of the script and let it all fall together. What is impressive is that even in the midst of an increasingly secularized Europe, this one little town still keeps the vow they made 375 years ago. The burgeoning arts culture in this little town that once faced extinction is a unique but very real example of what God can do, how He pours His grace down on those who place their trust in Him. Would you like to see the Passion Play this August? Salt + Light Television is pleased to offer you a wonderful opportunity to join us on a 10-day faith-filled adventure to Germany and Austria. The first in our series of Blessed Journeys will take you through Germany in the footsteps of Pope Benedict XVI. 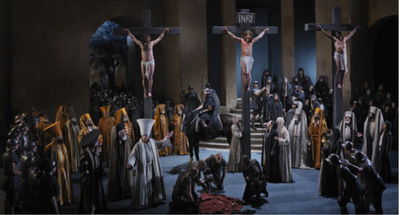 We will also attend the famous Passion Play in Oberammergau. Father Thomas Rosica will also be joining the group for part of the tour. Click HERE for full details.